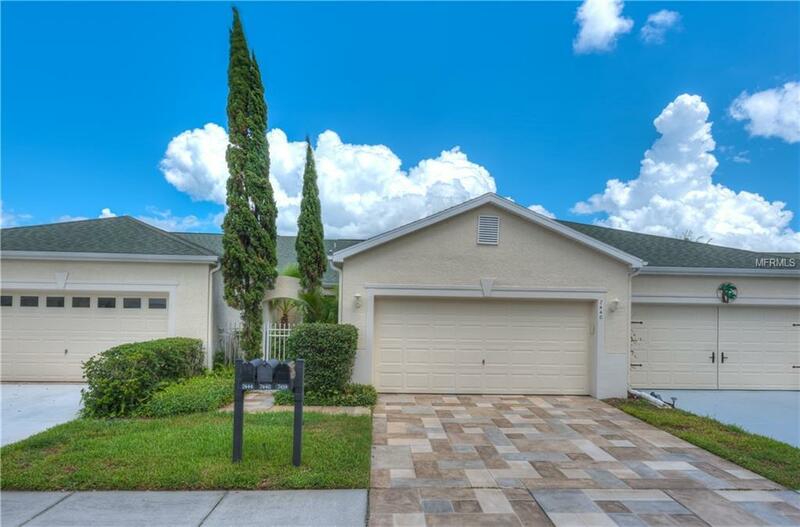 POPULAR Groves Golf & Country Club, a GATED ACTIVE 55+ community & included in the Tampa Bay Business Journal's list of top retirement communities, offers this 1,332 sf, 2 BR, 2 BA, 2-car garage, 1-story maintenance-free villa! Enjoy your morning coffee or a cool beverage from your EXTENDED BRICK PAVER lanai with conservation/pond views & no rear neighbors! From the gated courtyard, step into the foyer & the efficiently-designed kitchen with ample cabinets & counter space, a full appliance package, tile backsplash & reverse osmosis! The kitchen is open to the dining space & great room plan with easy-care Bamboo floors, designer lighting, ceiling fans & a remote-controlled SONY Professional Theatre Projection System ($30K value). The spacious master bedroom offers a Bay window & designer ceiling fan. The master bath features QUARTZ counters, dual sinks, walk-in closet & large walk-in shower. The guest bedroom offers an adjacent full bath with QUARTZ counters. A newer 3 TON A/C system with UV light has transferrable warranty. The HOA fee includes basic cable, bldg. exterior & landscape maintenance, roof replacement & access to all amenities! Drive your golf cart to the Pro shop in the 15,000 sf clubhouse with FULL SERVICE RESTAURANT, FITNESS center, community party room, HEATED SALT-WATER POOL & SPA, Bocce Ball, Tennis Courts, shuffleboard, dog park, Pickleball, driving range, putting green & a PUBLIX--located at the entrance to the community. Enjoy The Groves Social & Travel Clubs & 18 holes of golf!